With MatchBook Amazon Pushes The Envelope, Again! With the jam made, I can finally sit down and write about MatchBook. Amazon has gotten very good at releasing solutions to problems within publishing that many people have been talking about for some time but mostly (see comments below) doing nothing about. You’d have to wonder if the industry in general (and I include myself here) will get tired of allowing them set the pace of this digital transition and start working with start-ups to change that dynamic? But it’s worth working through those points and explaining them. The great thing about MatchBook is that in essence it’s making money for old rope. Customers who avail of it already bought the IP in the book they are “upgrading” and are paying simply to format shift. They’ve no real reason to do this, they are unlikely to do so at full price but a discounted price may well prompt them to buy increasing the overall revenue from that customer for that piece of IP and increasing revenues for Amazon, the publisher and the author. No one in the current chain loses anything in such a transaction (bookstores were never in the transaction to begin with). Sure complications arise where rights have been reverted, but authors can make print and ebooks available again, and here’s a great reason to do just that! This is driving revenue per customer and per title smartly. Taking these together as they make sense that way! Lots of folks seem to think E&P bundling is a good idea. I’m not sold on the value for me, and I’ll still buy mainly digitally only. But for wavering print buyers, E&P bundling makes a digital transition completely risk free encouraging them to try digital and maybe, just maybe converting them in the process. That’s good for Amazon. It’s okay news for publishers who at some point in the process will begin to wish all their readers were digital ones to enable them to kill costly print runs! For authors it’s neither one nor the other. This one is clever. So suppose you are a digital buyer from Amazon (or indeed anywhere) and your print purchases are mainly gifts or illustrated and you normally by them from local bookshops, MatchBook is a real incentive to shift those purchases to Amazon just to get your hands on the digital editions for a limited fee. And, if you are a print buyer who buys anywhere but Amazon, this encourages you to shift to Amazon or your print to ensure you can (if you want to) get a cheap eBook version! Most interestingly to me is that by opening up the hitherto closed incremental revenue option, Amazon is encouraging publishers and authors to make old books available both in print and as ebooks. This drives increased selection for Amazon making it better and more effective at its core goal (in this market of selling books in whatever format). The lure of potential sales will see more ebooks published especially for backlist titles that might once have had decent print sales an area that might see an uptick too. Conventional wisdom is that Amazon have been pinning their hopes on eBooks as the key area which might one day make them a profit (they’re certainly not making any money on sales of Kindle devices, which operate on absolutely wafer-thin margins). Yet MatchBook seems to fundamentally devalue that core product: it treats eBooks as commodities with no inherent worth; as products that can be given away for nothing as promotional tools. Even if the norm is for a $2.99 pricetag, rather than a straight giveaway, the inescapable conclusion is that the e-format is nothing more than an adjunct to print. Tom’s logic assumes that Amazon is committed to digital sales (which, while currently true, may not always be so) and only digital when clearly, so long as a customer spends on Amazon, it largely doesn’t matter hugely to the company what format the customer buys content in. Amazon’s strategy then could be simply to improve the value of its ecosystem in its entirety to book readers and encourage them to upgrade from one format purchases to two format purchases driving incremental revenues per sale and per customer and per customer lifetime. If Amazon can gain customers from a bricks & mortar outfits because of this development and it can also drive increased revenues per existing customer then this could really grow its business. who will want to continue paying the full price for eBooks as standalone products (which they have, at long last, managed to establish themselves as being) if they’re available for little or nothing when you buy the print edition? 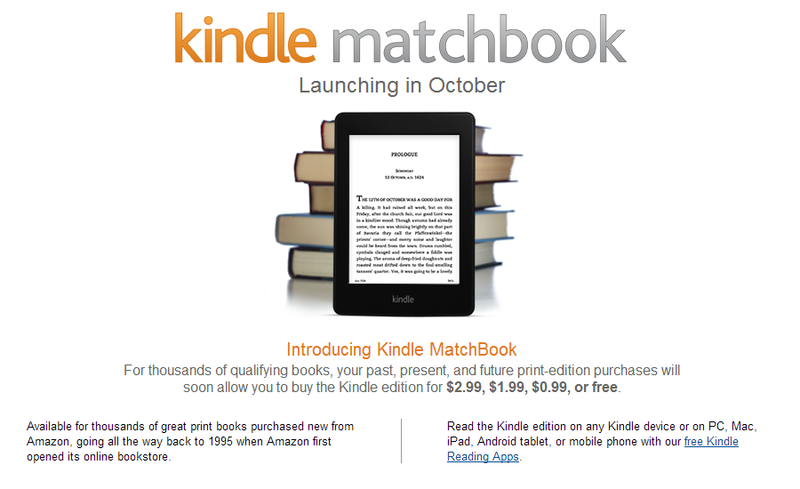 And what will MatchBook do to the general assumption about what eBooks “ought” to cost? What will that shift in buyer behaviour do to Amazon’s bottom line, I wonder? The answer is that just as many people will be unmoved by the offer of a cheap upgrade from print (those who never intend to shift to digital and are not in any kind of wavering camp likely to be attracted to such offers), many (like me) see absolutely no use for print in most circumstances. In fact I view print as a nuisance for most of my reading (though I see it as incredible for several other circumstances). That Tom does not see this suggests he sees print as always having value, but in truth, often it does not have any value at all and so people like me will pay the full price for ebooks because they don’t need or want print. But I think this could be a great opportunity for high street retail, rather than a death knell. If bookshops can get in on the act and start offering bundling as well, they may well be in a better position to take advantage of it. For a start, bookshops’ core products are print, rather than e-books, and so unlike Amazon, they won’t be undermining their own health by giving away the e-format. They’re also in a great position to be able to up-sell to customers: there’s no competition between an engaged and enthusiastic bookseller and a website algorithm. And if bookshops can build the right infrastructure, they might be able to offer customers e-editions in non-proprietary formats for more than one sort of device, rather than just the Kindle edition. While, as you might imagine, I’m not sold on his logic for the benefits, I do see how bundling and up-selling (and I’d say not just up-selling of ebooks, but experiences and more) to print customers offers some potential for book shops. However, as I cautioned earlier, some print buyers simply have no interest in ebooks, arguably (though I may be mistaken) print buyers in local bookstores are probably the most resistant to them, making ebooks perhaps not the right up-sell for them! On the other hand, Amazon’s very existence is a problem for the bookshops so MatchBook will not really change the nature of the problem, merely perhaps the keenness with which it is felt. All things considered, I don’t see a negative for MatchBook from Amazon’s perspective drives forward where most others just have yet to push too hard. It may actually help drive adoption of E&P bundling and grow revenues for everyone (except bookshops!). Ahem… just a small point, but when you say E&P bundling is an issue that “people have been talking about for some time but doing nothing about”, I feel compelled to shout out for the good folks at Angry Robot. They launched their Clonefiles initiative back in July 2012 as a means of offering additional support to indie bookstores in the UK and have recently announced the roll-out of Clonefiles in the US. Much smaller scale than Amazon’s Matchbook programme, of course, but still… someone has been doing something for over a year. Yes, you are totally correct and I was conscious of that when I wrote it, what I should have said (and have now amended the piece to reflect) something about it/ However the thrust was to get across the fact that as an industry we have had the tendency to highlight but not solve industry wide issues! You’re absolutely right, the publishing industry as a whole does tend to be extremely change averse, which manifests in a vulnerability to business model disruptors like Amazon (and others). I think a lot of it has to do with the silo-mentality that occurs in the larger publishing companies, coupled with the long production lead-times and, oh, all sorts of other factors. Several blog posts’ worth, I’m sure.